bdChat is a simple chat replacement. 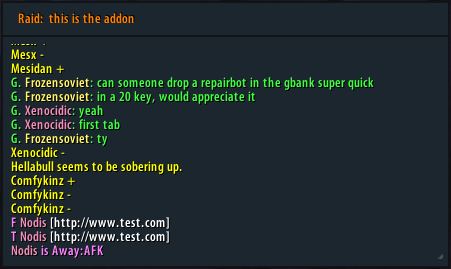 - Added option to justify the chat log to the RIGHT, editable via lua. - Improved code and removed bugs. Removed Link copier, there are lots of independent mods for this. Remove the annoying Chat Channel icon on the left and also the scrollbar on the right. Please! Or how to? BIG ISSUE: Anything other than Guild chat is not being displayed. Last edited by Siannus : 07-21-18 at 05:17 PM. Got this error since pre-patch. What can I do to fix it? Anyone know how to add chat tab flash? Here's the edit I've been using. Added a pop-up window for URL copy (thanks zork!) and a couple gsub changes. It's probably very sloppy and there's probably a better way of implementing a couple gsubs but I'm bad as crap at lua. re: comment in bBag comments thread! Combat Log text tab doesnt auto fade after login. How can i turn it to auto fading? change it to be "hidecombat = true"
1. how can i anchor the editbox to the bottom of the chat? 2. how can i change the duration till the chat fades out? how can I turn the URL copy option on? What do I have to do in the LUA file to copy URLs? You can change the font or font size within that. The reason I took out the option was because this will override your size option as well as any custom fonts. As far as text align to the right... well first, keep in mind that addon authors do work for free, and don't always check comments, don't get impatient. Anyways, I'm updating the addon right now, with a few bug fixes, code cleanup, and the ability to align the combat log to the right. If you'd like to do it with additional channels you can add this code anywhere. where "2" is the number of the chat, 2 is the combat log. 1 for main etc. Last edited by Blooblahguy : 02-26-11 at 03:58 PM.